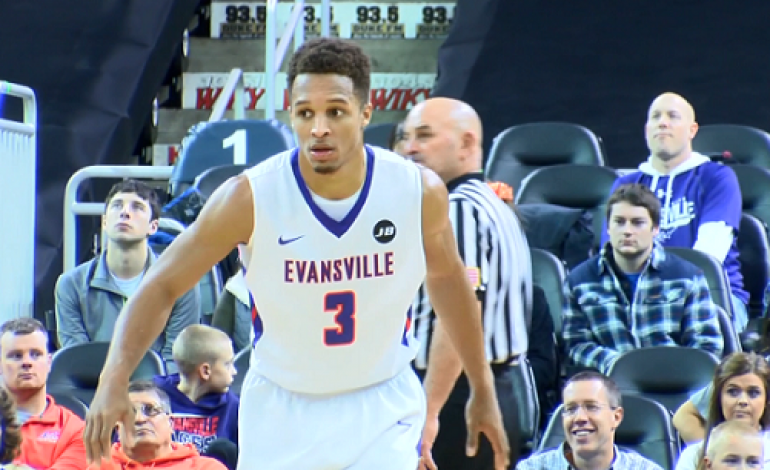 Three days after Evansville Men’s Basketball fell to Illinois State in Arch Madness, senior Jaylon Brown began preparing for a professional playing career. Brown told 44Sports before the conference tournament he aspires to play at the next level. The Fishers, Indiana native led the Missouri Valley in scoring this season, averaging 20.9 points per game. He was also named to the MVC All-Tournament Team. Rob Blackwell, who is the Director of Skills Development at St. Vincent Sports Performance, told sports director JoJo Gentry that Brown has been working with Blackwell. SVSP has locations in Carmel, Fishers, and Indianapolis. Blackwell indicated to Gentry Monday that Brown has not committed to a trainer or agency. JOJO: St. Vincent has trained players, like Gordon Hayward and George Hill. Now, you’re working with UE senior Jaylon Brown. What are you seeing in terms of his potential to go pro? ROB: We thought he came off a really good year. I’ve known him and followed him since high school at Fishers High School, so he’s an Indianapolis guy. But, the most impressive thing is his determination and focus. He was in the gym three days after their season ended, ready to work on the next level for himself. So, his focus and determination are going to be his biggest advantages. He was in the gym three days after their season ended, ready to work on the next level for himself. JOJO: Is there anywhere you can see Jaylon right now in terms of his talent level…watching him in high school, college, and now around Indianapolis? ROB: He’s a great prospect for overseas. There are several guys, who didn’t score or play at the level where he is, that are very successful over there. I think he would be a great fit in the NBA Development League right now for specific teams giving him an opportunity to advance. But, at the same time I think his talent level is at that level…to go up everyday against NBA quality talent. And at that point, we can see exactly where he stands. JOJO: How would you describe the connection between the two of you? ROB: I was introduced to him by one of his high school teammates. We kind of knew each other, and he’s been to a few of my open gyms. So, we were extremely familiar with each other. And you always like his demeanor, because it’s not over-bearing. He’s pretty quiet. I wouldn’t say shy. He’s a confident kid. He walks around with a lot of swagger. He’s a confident kid. He walks around with a lot of swagger. JOJO: What do you look for in terms of talent in a potential pro player? ROB: The work ethic is the main thing. Usually, the skill level we can increase over a very short period of time as long as the guy has a work ethic. So, if somebody’s shooting needs to be improved or ball-handling or IQ…we can get in and sit down with them for video and make sure our goals are the same.